For the past few weeks, the FT4C spotlight has been shining on students, schools, community gardens, and community learning centers. Today’s spotlight is directed at another pillar of the community: the artists. Our mission is to showcase emerging and established artists of various cultures & disciplines, to explore & refine their work, to provide collaborative opportunities for interdisciplinary artists, and to produce special events that brings together artist and community, enriching the cultural climate and enhancing the quality of life. Salon des Enfants. Photograph from the Alwun House website. For 45 years, the Alwun House has been the site of performances, community gatherings, and events that connect artists and the community. It was the first registered 501c(3) nonprofit alternative|contemporary art space in downtown. 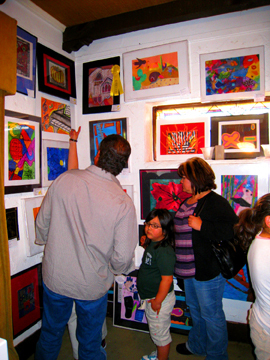 The Alwun House serves young artists as well: the Salon des Enfants partners with Phoenix Elementary School District #1 to display 300 works of art by 5th-8th graders. All proceeds from purchased artworks benefit the artist, empowering youth to see and experience their work in a gallery setting. Other programs include: a Meet and Greet series, where police and Garfield residents build trust and partnership over food and games; Home Buyer Workshops, where residents can ask a panel of experts about financing and buying a home; a neighborhood newsletter production; and more. The Alwun House is constantly expanding its vision: currently,the organization is creating a Green Art Park–a lush multi-use space filled with trees, community gardens, sculptures, and murals. The project was recently approved by the City of Phoenix after two years of planning. The park projects envisions over 40 uses, including health fairs and youth art-making workshops. The historic Alwun House. Photograph from the Alwun House website. 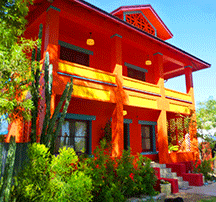 The Alwun House has a history of greening and beautifying the neighborhood: the first 10 years were dedicated to planting trees, building koi ponds, and forming the lush gardens that the space is known for today. In fact, this beautification earned Alwun House its first honor, the “Environmental Quality Improvement” award from Mayor Margaret Hance. We’d love to help Alwun House continue this work in the community and bring their lush vision to life with FT4C fruit tree–and you can help! With the purchase of 3 fruit trees, you can choose to have 1 tree donated in your name. Order by October 25 from the FT4C website. To learn more about the Alwun House and get involved in their programs, please visit their website. To stay current on all their events, follow them on Facebook.